Feeling cross-eyed when using your binos? They are probably out of alignment! We can fix this for you along with any other issues you may have or damage that needs attention. Even just a simple clean, your binocualrs will be cleaned professionally with prisms removed to get into all of the elements/prisms. You’re describing some of the things that happen when binoculars are out of alignment. The binocular is a pair of telescopes mounted side by side, each supplying an image to one eye. Your eyes and brain blend the two images into one. For this magic to happen, the two telescopes have to be parallel, in alignment. But things can happen to binoculars. If they’re dropped, or knocked, or sat on, for example, the alignment between the two telescopes can be messed up. No longer will they point in exactly the same direction. Then your eyes will strain to bring the two images into alignment, causing strain and headaches. 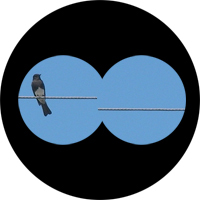 You can’t tell just by looking at a binocular whether it is in perfect alignment. That takes very expensive equipment. However, you can check for gross misalignment. Here’s how to do it. 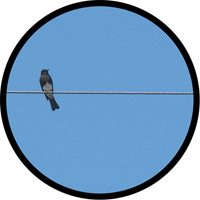 Pick out a horizontal line, such as a power line or a roof line. Look at it through your binoculars. While you’re looking through the binocular at the horizontal line, slowly pull the binoculars away from your eyes, about two or three inches. 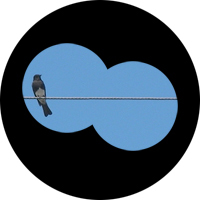 Notice in the image above that the power line makes one continuous line through both circles. That means the binoculars are in alignment. 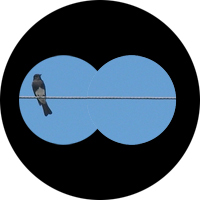 When binoculars are out of alignment, the two images will be fighting with each other. Your brain and the muscles in your eyes will have to strain to pull the two parts into line, so that you see a single image. This effort is likely to cause a headache. Or it may just make it feel like it’s not much fun to look through the binoculars. If your binocular is out of alignment, you can’t fix it yourself. Bring them in here and our binocular specialist will take care of it. Or replace it. If it’s not under warranty, it’s probably not worth paying to get it fixed, unless it’s a very valuable binocular. You may consider this option if you have a very old pair of binoculars that are made of older, heavier materials and have poor lens coatings. You would be suprised at just how little you would have to spend for a very good pair that may be quite an improvement on what you currently use. Check out the Binocular range here! Note that the cheaper the binocular, the more easily it is likely to get knocked out of alignment. High-end binoculars have higher quality engineering, so they’re better able to withstand the normal shocks of a binocular’s life without going out of alignment. And if they do get out of alignment, the manufacturer is more likely to be willing to fix them.